57th Nehru Trophy Boat Race was held on August 08 at Punnamada Lake, Alappuzha. Snake boat Champakkulam Chundan won the race. Honorable Member of Parliament and UPA Chair Person Smt. Sonia Gandhi, was the Chief Guest. 59 boats took part in the competition. First: Snake boat Champakkulam Chundano of the Jesus Boat Club, Kollam, led by Jiji Jacob. Second: Payippad Chundan of UBC, Kainakary, led by Ansalam Antony. Third: Sree Ganesh Chundan of Kumarakam Boat Club, led by P.I. Abraham. First: INR 2,00,000 by State Tourism Dept., and INR 1,00,000 by Out Look magazine. Second: INR 1,50,000 by State Tourism Dept., and INR 50,000 by Out Look magazine. Third: INR 1,00,000 by State Tourism Dept., and INR 25,000 by Out Look magazine. 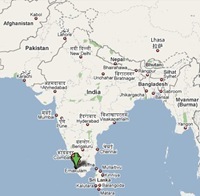 Fourth: INR 50,000 by State Tourism Dept., and INR 10,000 by Out Look magazine. Race track: 1.35 kilo metres long, 20 metres wide and the team takes less than 5 minutes to cover the distance. 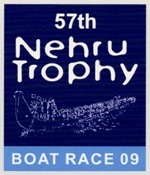 For more details, log on to Nehru Trophy Boat Race.